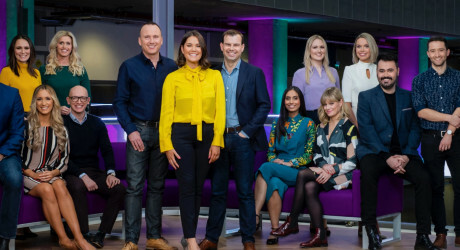 MEET the faces of The Nine – the BBC Scotland team that will bring the national and international news to Scotland in the new channel’s flagship nightly hour-long programme. Heading the 15-strong core team are presenters, Rebecca Curran and Martin Geissler, two of the country’s leading journalists, and chief news correspondent, James Cook, who joins the Nine from his post as BBC News North America correspondent. Taking a global view on the news while maintaining a distinct Scottish voice, the programme features a hand-picked team of reporters and correspondents who will cover everything from social affairs and innovation to consumer matters, sport and entertainment. There’s also a four-strong team who will report on politics from Holyrood, Westminster and Brussels. The Nine will be at the heart of the schedules, broadcasting Monday-Friday between 9-10pm in addition to weekend bulletins. Rebecca and Martin will co-present Monday-Thursday while Laura Miller and John Beattie will present the news hour each Friday. On Saturdays, there will be a 15-minute bulletin at 7pm, followed by a review programme presented by Fiona Stalker and Nick Sheridan. On Sundays, the 15-minute 7pm bulletin will be presented by Lucy Whyte. The programme will have a distinct social media presence and can also be accessed on digital platforms. The Nine is part of the biggest investment in the BBC in Scotland for a generation which has seen the creation of 80 new jobs in news services in Scotland, covering a range of roles both in front of and behind the camera. Rebecca moves into her new role as co-anchor after two years in BBC Scotland’s busy Aberdeen newsroom. Widely recognised as one of the most tenacious broadcast journalists in the country, she has a wide-reaching and proven track record in reporting a diverse range of subjects ranging from hard-hitting investigations to moving human interest stories. She started her career at Northsound Radio and then spent three years at STV before joining the BBC in 2016. Most recently a news correspondent with ITN, Martin has reported on some of the biggest news stories this century: the Iraq war, the Afghan conflict, Hurricane Katrina, the Boxing Day tsunami, the crisis inside Zimbabwe, and many more. Previously Europe, Africa and Scotland correspondent for ITN, he started his television career with Sky News in Scotland and has worked as a reporter and presenter for STV and as a correspondent for Sky Sports. James joins the Nine as chief news correspondent from his post as North America correspondent for BBC News where he reported on major stories from shootings and racial unrest to wildfires, hurricanes and Donald Trump’s presidency. Starting his career in local radio, he moved to the BBC in 1998 as a sub-editor. He then presented news programmes including Reporting Scotland and Good Morning Scotland and was appointed Scotland Correspondent for BBC News in 2008. Widely viewed as one of Scotland’s top broadcast journalists, James is a great story-teller and a hugely engaging TV reporter. Laura joins the Nine from her role as the East of Scotland news anchor on STV’s News at 6. As a reporter, she’s covered some of the biggest stories of recent times, including the Independence Referendum, the Clutha helicopter tragedy, the 2014 Commonwealth Games in Glasgow and the 2012 Olympics in London. Laura has a Masters Degree in Broadcast Journalism from University College Falmouth in Cornwall and an LLB in Law and French from Glasgow University. John Beattie had a long and illustrious career before broadcasting. He’s both a qualified civil engineer and chartered accountant as well as a Scottish rugby internationalist. He chaired the Scottish Executive’s Physical Activity Task Force and wrote for newspapers on sport and business before presenting Rugby Special on TV. He has covered Commonwealth Games, Rugby World Cups, and Olympics for TV and radio, hosted his own sports programme on radio, commentated on rugby for TV and radio, and hosts his daily news programme on BBC Radio Scotland. Amy, an experienced news, entertainment and sports presenter, joins the Nine from the Capital Radio Breakfast Show. An accomplished self-shooting video journalist, she graduated in multimedia journalism from Glasgow Caledonian University and then joined West FM as a news and sports reporter. From there, she joined STV before moving to Capital Radio in 2017. She has been nominated for top industry awards including an ARIA award. Laura has worked on digital and radio sports news at BBC Scotland for the past five years. Most recently, she’s worked as a journalist in BBC Sport’s developing audiences team, creating video and digital content across all BBC Sport platforms. She covered last year’s Commonwealth Games in Australia and has also reported on Scottish football, Women’s Six Nations rugby and golf’s Scottish Open and Women’s British Open. Laura will present on the days Amy does not, and will also be the face of the Nine’s sports news coverage at weekends. Jean joins the Nine from her post as senior reporter on BBC2’s Bafta award-winning Victoria Derbyshire programme. Before that, she was a reporter for BBC London News and political reporter for Radio 1 Newsbeat. Jean is a creative story-teller with a passion for finding exclusive stories and investigating the impact of policy on people’s everyday lives. Her innovative and compelling content has been widely shared across digital and social media platforms. As winner of the prestigious BBC Gareth Butler trainee scheme, Rajdeep spent a year working across online, radio and TV and then became political reporter for BBC Radio Kent covering many local issues as well national ones, such as Brexit. She studied journalism at City University, London. In her new role as Westminster Correspondent, she’ll be at the very heart of British politics and reporting on how it impacts Scotland. Lynsey studied journalism at Strathclyde University before starting her career in local newspapers. She joined the Press Association in 2010 as a political reporter, based at the Scottish Parliament. Since then she has reported on election campaigns, the independence and EU referendums and some of the biggest breaking news stories in Scotland. Lynsey has also regularly appeared as a contributor on current affairs radio and television programmes. David worked at BBC Scotland as a trainee in the run up to the Scottish independence referendum in 2014. After that, he joined BBC Question Time, covering two elections and the Brexit referendum. David has been producing Question Time for the past two years, but will now be moving in front of the camera to report on politics from Holyrood and around the country. Chris spent nearly a decade in newspapers before moving into broadcast in 2017. During a four-year spell at the Daily Record, he broke a number of exclusives including an investigation into abuse in youth football. He also covered some of the biggest stories of the last few years, such as the Clutha helicopter disaster, the Glasgow bin lorry crash and a number of major criminal cases. He moved to STV News where he covered issues including minimum-unit alcohol pricing and childhood obesity. Laura has been a broadcast journalist for 12 years. She began her career at Moray Firth Radio in Inverness before moving on to STV News North where she spent 11 years as a reporter and presenter. During that time, she covered a wide range of stories across the country and anchored a live hour-long programme for the official opening of the Queensferry crossing. She joins the BBC as innovation correspondent, based in Dundee. With a background in commercial radio, Chris joined BBC Scotland in 2004 and quickly became a key member of the sport team’s operation, working across TV, radio and online. In 2010, he became BBC Scotland’s senior football reporter and has reported on stories including the financial collapse of Rangers and the Scotland national team’s continued frustrations on and off the pitch. He has also worked on a number of attachments for BBC network news including covering the Commonwealth Games in Glasgow in 2014 and the Olympic Games in Rio in 2016. David has a wealth of live broadcast experience. He co-presented STV’s Live At Five, which won an RTS Scotland Award for Best Daytime Programme, and picked up a Sony Radio Award for his celebrity-based evening music programme on commercial radio. Over the years, he’s interviewed celebrities including Rihanna, Calvin Harris, Lady GaGa and Taylor Swift. He has also presented and produced a range of documentary programmes and has hosted countless live broadcasts from events including the Edinburgh Fringe, T in the Park and TRNSMT. MEDIA RELEASE issued by BBC Scotland. You too can share your stories (aka press or media releases), on this site. Email here for more information.